The holidays are so very full of wonder: twinkling lights, happy music, above-average kindness to our fellow humans…all you have to do is look up from your screens to be a part of it. Knowing that kiddos sometimes think of the holidays as one big gift-a-palooza, it can’t hurt to be a more intentional about focusing on people and experiences. Here are 12 ways for families to spread genuine, heartfelt cheer as you count down the days to Christmas. Christmas music gets almost everyone feeling very merry. Need to liven up a holiday party? Turn on some tunes! Even better—ask everyone in advance what their favorite Christmas songs are and have a playlist ready to go. You’re sure to hear old favorites and find some new ones. Wanna get the kids away from the video games? Pump up the volume on the Bluetooth speaker or pull out the guitars and turn your living room into a karaoke bar or concert hall. If you’re ready to belt out a few jolly melodies outside of your shower or car, consider joining a group or taking the family for some caroling at a children’s hospital or nursing home. Decorate an extra Christmas tree with a particular theme—maybe something kid-friendly? Or over-the-top sparkly? Or covered in peanut butter pinecones and dried fruit for winter birds? Try a new recipe that the whole family can help with. If you’re looking for sweets, we’ve got some to get you started. For even more ideas, check out this article. If your new holiday experience is a big hit, you’ve found something fun to do for years to come. If not, you can always try something different next year. No matter what, you’ll be hanging out with people you love, and what’s not to love about that? 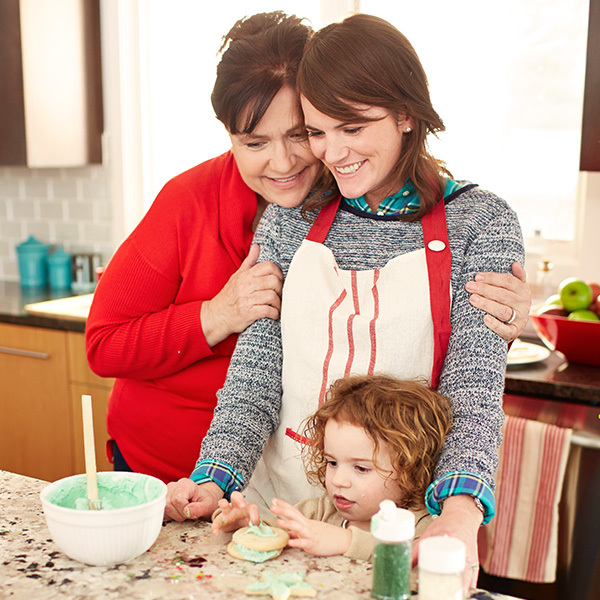 Speaking of recipes…nothing spreads cheer quite like a platter of sweet treats. Gingerbread and chocolate chip cookies for Santa are staples in lots of households. But why not mix things up this year? Strawberry Santas will jolly up any holiday gathering without too much of a sugar high. If you’re feeling more adventurous, Bibingka is a rice flour cake from the Philippines that’s traditionally enjoyed during the holiday season. Rosca de Reyes is a traditional Mexican dessert—a highlight of the holiday season for many people. Talk about a sweet way to introduce a new culture to your family and friends. If you’re trying to find some extra-special gifts, how about the gift of gratitude? Write a personal note in a Christmas card that expresses how much someone means to you and how happy you are that they’re a part of your life. Have you thanked your parents recently for putting up with you during those years? Now’s the time to write a heartfelt, handwritten letter! Remember to say thank you to people doing their jobs or just being thoughtful—niceties sometimes get forgotten in this hustle-bustle time of year. Leave a merry little gift for your mail carrier, garbage collector, favorite grocery person, or even your local fire and police departments. Teach your kids how to write a good thank you note. We can help. ’Tis the season for giving, and there are big and small ways your generosity can make someone’s Christmas extra jolly. Don’t know what to do with last year’s too-small coats? Donate them to a charity or homeless shelter. Made way too many of those Strawberry Santas? Share them with your colleagues. Take some treats and old blankets to an animal shelter—or look up their wish list online. Adopt a family in need to help them have a truly merry Christmas. Have friends over and send them home with leftovers so they don’t have to cook the next day. Give someone a book you enjoyed with a note to pass it on when they’re done. Or drop some of your favorite books in a Little Free Library. There are countless ways to share what you have… no matter your budget. There’s no time like the holidays to reach out to those who are quite literally the closest to us: our neighbors. Extend an invitation to dinner. It doesn’t have to be fancy, and it’s always a nice gesture. Consider dropping a plate of treats on the doorstep. Check in on your elderly neighbors—maybe even shovel their sidewalk, offer to carry their groceries, or help them deliver packages to the post office. Showing you care, even in small ways, can mean so much. You would totally win the Best Neighbor of the Year award if that were a thing. And it should really be a thing. Got more than 20 seconds to spare? Consider some of these ways to really guarantee your spot at the top of Santa’s nice list. And the best thing of all? You can do all of these things year-round to really keep the good cheer going. Call your folks—they can’t wait to hear from you! Need more ideas? Read this. 1. Have each member of your family save a little money throughout the year. It doesn’t need to be a lot—just whatever they can afford to set aside. 2. When Christmas rolls around, let each person choose someone deserving to spend it on… it could be a family member, friend, total stranger, or a charity. 3. Get together and share who you chose, why you chose them, and what this experience of giving was like. And, hey, this could be another opportunity to make something yummy together. After all, everything’s better with snacks. Everyone knows that gifts are great, but if they keep on giving? Even better. Got something that you’re really passionate about, like stopping animal cruelty, promoting literacy, alleviating hunger, or helping kids in need? The magical Internet can help you find companies that donate a portion of their proceeds to a whole range of worthy and wonderful causes. You’ll get extra points if you support your recipient’s passions. Make donations in the names of those hard-to-shop-for people who already have plenty of stuff. However you can and whenever you can, it’s nice to lend a helping hand. But sometimes it’s easy to forget this at home. If someone’s doing laundry, help fold. If someone’s had an exhausting day, offer to do the dishes. Pour an extra cup of coffee for your partner in the morning, and maybe even throw an extra piece of bread into the toaster. And if you’re the one needing some help, don’t be afraid to ask. Get those kiddos involved, too! Sure, it’s a holly jolly time of year, but it can also be overwhelming, stressful, and downright bah-humbuggy. Sometimes just knowing other people are there to share the load can do wonders for boosting that good ol’ Christmas spirit. At least some of the time this season, let jingle bells be the only bells ringing. Good idea #1: Silence your devices, because nothing distracts quite like those chimes, dings, and chirps. Good idea #2: Close your computer—the world probably won’t end if you don’t respond to that email right this very second. Now what on earth are you supposed to do with all that silence? Good idea #3: Focus on the person you’re with. Listen to what they’re saying and be truly engaged. Good idea #5: Give good hugs. Bear hugs. Long hugs. Cheek-to-cheek, heart-to-heart hugs. It’s amazing how much more connected you can be to those around you when you disconnect from all those shiny, noisy gadgets. How will you spread cheer this holiday season? We’d love to hear your ideas. Share your moments by tagging @HallmarkStores in social media.